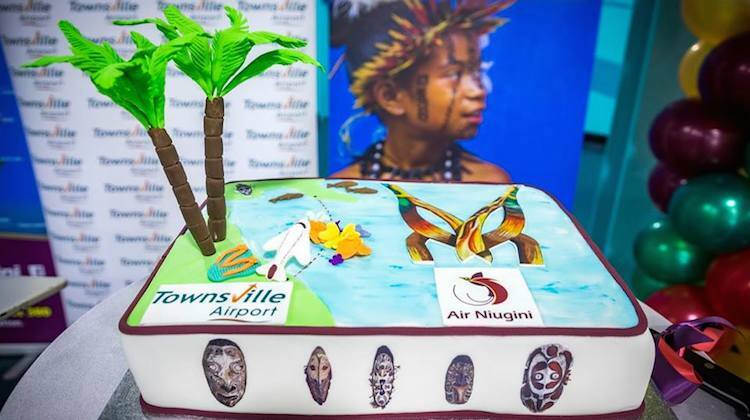 Air Niugini has commenced nonstop service between Townsville and Port Moresby. Flight PX60, operated by Boeing 737-800 P2-PXC, touched down at Townsville a little after 1130 local time on Monday, after a 90-minute journey from the Papua New Guinea capital. 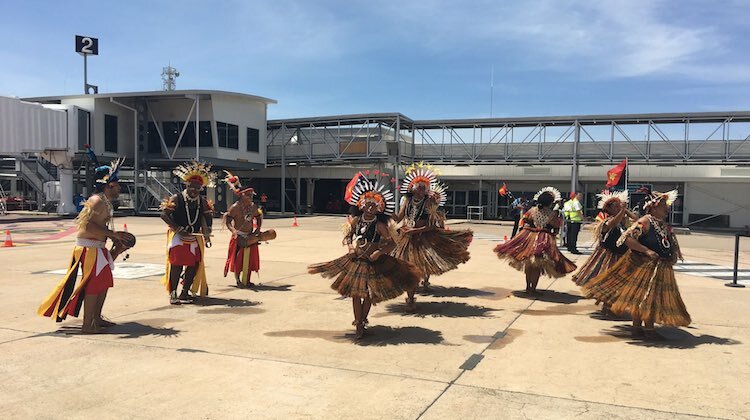 The aircraft, which was greeted by a celebratory dance on the tarmac, was on the ground for about 80 minutes before taking off as the reciprocal PX61 to Port Moresby. While a 737-800 was used for the inaugural flight, the twice weekly offering would be served with Fokker 70 equipment. Townsville is Air Niugini’s fourth destination in Australia. The Papua New Guinea flag carrier also serves Brisbane, Cairns and Sydney from its Port Moresby hub. 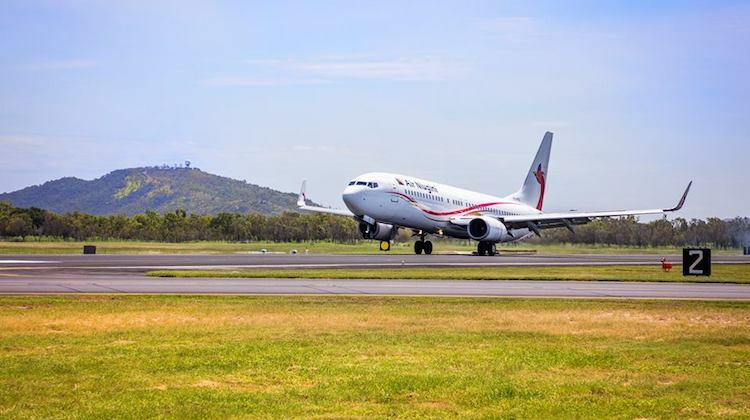 Air Niugini chairman Sir Frederick Reiher, who was on the inaugural flight along with Papua New Guinea Prime Minister Peter O’Neill, said the service would save residents of Townsville and the wider region time and money when travelling to Asia and the Pacific. “This service will offer the citizens of Townsville and other centres such as Mackay and Mt Isa the efficient international “connection” they don’t currently have – transiting here before traveling to our major Asian centres such as Manila, Singapore and Hong Kong as well as Honiara, Nadi, Port Vila , Pohnpei and Chuuk in the Pacific,” he said in a statement. Port Moresby is Townsville Airport’s second international destination, after Jetstar commenced nonstop flights to Denpasar in September 2015. Townsville Airport chief operating officer Kevin Gill said locals would no longer have to travel backward via Brisbane to go overseas. Moreover, Gill expected the route to deepen already strong ties between Papua New Guinea and North Queensland. “Papua New Guinea and Townsville share a rich Defence history, with the Kokoda trail located in Port Moresby and Townsville being the largest Garrison city in Australia,” Gill said. Will be well supported both ways, many in Townsville do business in PNG and reverse, the F70 will be good size to start with, the long delays in Cairns or long trip to Brisbane will not be missed by many, family of mine were on the first flight and I suspect we will see them much more often, around home games for the Cowboys I would imagine. Easy access from Townsville to overseas destinations has been a major problem since Qantas suspended their B747 services. Hopefully more airlines will now consider Townsville as a destination for business as well as leisure. Auckland is currently being discussed by our local authorities and tourist marketing bodies. Burdekin / Townsville / Hinchinbrook as well as the Western areas has much to offer with respect to business opportunities and the leisure market. every time airlines fly into Townsville soon after they pull out for lack of support., Qantas has tried time and again to make it work. we will see how long it lasts this time. the Denpasar flight is a red eye purely for holiday makers. the demographics show the biggest PNG population in cairns. You raise some good points, but you could also argue that for a long time there haven’t been enough variety of services and/or destinations to entice and sustain pax, and the routing of international services in the opposite direction to the destination (ie via Brisbane) was completely useless in attracting a ground-swell of pax at TSV. The net effect of this is that the airport operator doesn’t commit to facilities (lounges, shops etc) and pax are underwhelmed by the experience. Let’s face it…. as much as travel is about the destination, it’s also about the experience which includes the airport, the variety of services, and the interconnectivity of flights…. and unless something is done to break the impass on facilities at Townsville, then support for services and the capacity to build a route network (even a modest one) will always be less than it should be. Building on that, whilst Bali and Port Moresby are a good start, to achieve market penetration and economy of scale, TSV probably also needs a service like the SQ Capital City Express on the Singapore-Canberra-Wellington route, albeit using smaller equipment like the A321 NEO (which would have the legs to get into Asia – vale the B752 which probably arrived 25 years too early for Australian airlines to make sense of its utility and potential). With what would ostensibly be one service, the city would get both Asian and NZ destinations, and the pax volume and network to truly underwrite the airport as a niche international facility. Mike9 Qantas is a VERY high cost airline. Jetstar is well suited to TSV. Charter flights could operate in peak season to NZ (not AKL though), thinking South Island. Once low frequency charters like once a week, were successful, scheduled services could then operate.